AMG Publishers, a premier provider of Christian books and Bibles that help the average person understand the Bible in its original languages is proud to present to you the multi-functional reference tool that is AMG’s Comprehensive Dictionary of New Testament Words. This dictionary is your gateway to discover the meaning of the words in the Greek New Testament, even if you don’t know the first thing about the Greek language. Part one contains defintions or cross-references for more than 8,000 English terms, definitions that are based on the meaning of the more than 5,000 Greek words in the Greek New Testament. But, unlike some other tools, where you have to know the Greek alphabet or must first look up a Strong’s number before you get to the real meaning of things, this dictionary is organized alphabetically by the words in your English New Testament. It covers all the common English words and all the names of people and places found in the New Testament, and often lists the Scripture references where that word is used. The primary entries also list the Greek words and Strong’s numbers so that you have them as a reference to other works, but no knowledge of Greek is needed to make full use of this dictionary. Part Two is a simple lexicon of the Greek New Testament words, organized by Strong’s numbers, defined by terms found in Part One, so that when you want to dig deeper you can look up the other English word entries in Part One where that Greek word is mentioned. So now you are looking closer at the dictionary, wondering which English translation it is based on, trying to decide just how it will fit into your Bible study. 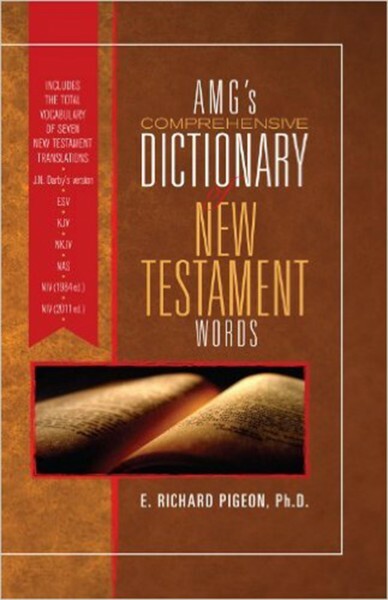 That is the best part; this dictionary is based not on the English words of any one translation, but on the total vocabulary of seven different English translations: J. N. Darby’s version, the King James version, the New King James Version®, the New American Standard Bible®, the New International Version® (1984 edition), the New International Version® (2011 edition), and the English Standard Version®. And the Scripture “quotations” found in the work are actually the author’s paraphrased text so that no one English version is favored over another. Multifunctional but easy to use, comprehensive but focused on one English word at a time, AMG’s Comprehensive Dictionary of New Testament Words is the perfect tool for studying the English New Testament in the version of your choice.